In a maritime country like Greece, the god of the sea occupied a high position in the divine hierarchy. In power, Poseidon was considered second only to Zeus (Jupiter), the supreme god himself. His implacable wrath, manifested in the form of storms, was greatly feared by all mariners. In an age without mechanical power, storms very frequently resulted in shipwrecks and drownings. The temple at Cape Sounion, Attica, therefore, was a venue where mariners, and also entire cities or states, could propitiate Poseidon by making animal sacrifice or leaving gifts. 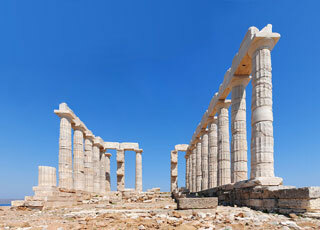 The temple of Poseidon was constructed in 444-440 BC, over the ruins of a temple dating from the Archaic Period. It is perched above the sea at a height of almost 60 metres (200 ft). The design of the temple is a typical hexastyle, i.e., it had a front portico with six columns. Only some columns of the Sounion temple stand today, but when intact it would have closely resembled the contemporary and well-preserved Temple of Hephaestus beneath the Acropolis, which may have been designed by the same architect. This article uses material from the Wikipedia article "Temple of Poseidon at Cape Sounion", which is released under the Creative Commons Attribution-Share-Alike 3.0 License.